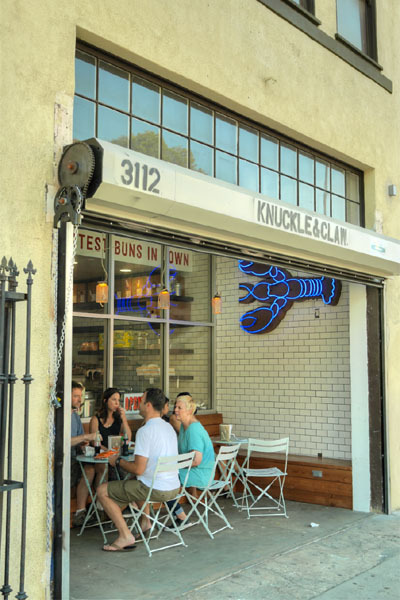 One of the newest, more promising players in the lobster roll game has gotta be Silver Lake's Knuckle & Claw. 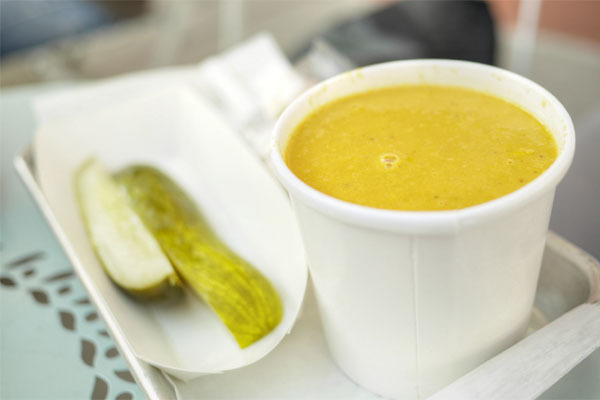 The place is the work of business partners/lovers Nikki Booth and Chloe Dahl (granddaughter of writer Roald Dahl), who first started slangin' their rolls over at the Beverly Glen and Brentwood farmers' markets last year. They eventually launched a Kickstarter at the end of November, and wound up raising nearly $77,000 in a month. 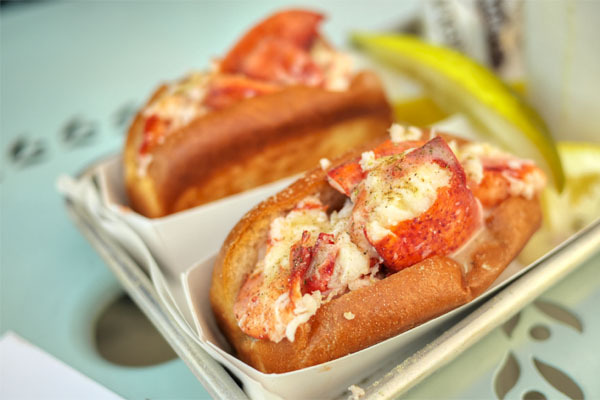 The restaurant debuted at the start of March, aiming to serve seafood-centric rolls with minimal filler, ostensibly made using product flown in daily from Maine. The site of the old Speedworkz bike shop was transformed by local firm Office42 to a subtly New England-y affair. There's some seating at the bar inside, but more in the patio and the area out front. 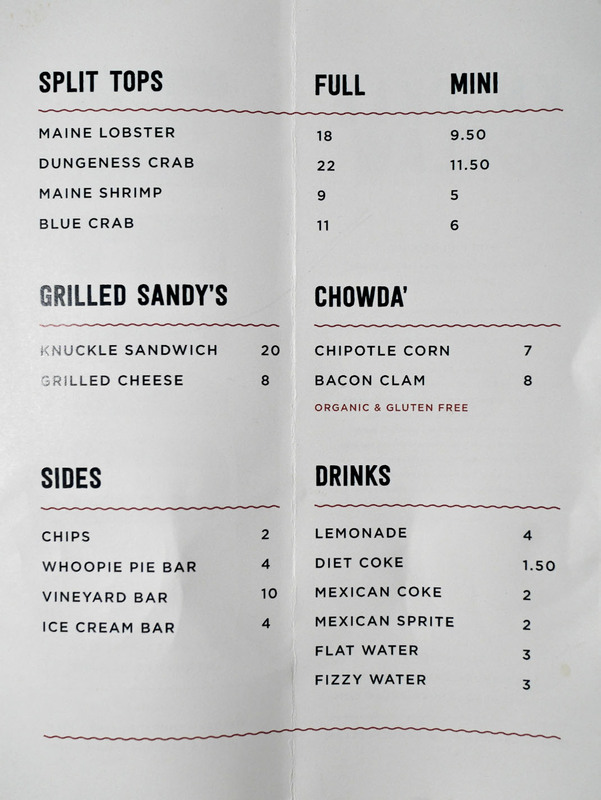 The Knuckle & Claw menu is refreshingly compact, with just four types of rolls in full or mini sizes joined by two sandwiches, two chowders, and some sweets. Click for a larger version. 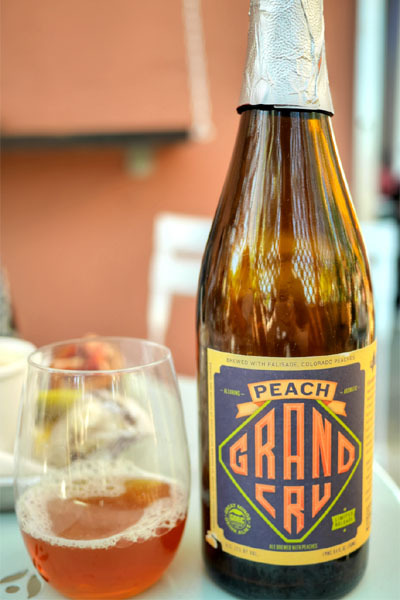 We snuck in our own bottles for BYOB purposes, and got things going with the 2013 Great Divide Peach Grand Cru, a Belgian-style ale with peaches. It was a decent brew, though not particularly notable, smelling of Belgian-y yeast, spice, and booze, while the taste gave up more spice and malt, with the fruit coming in strong toward the close. 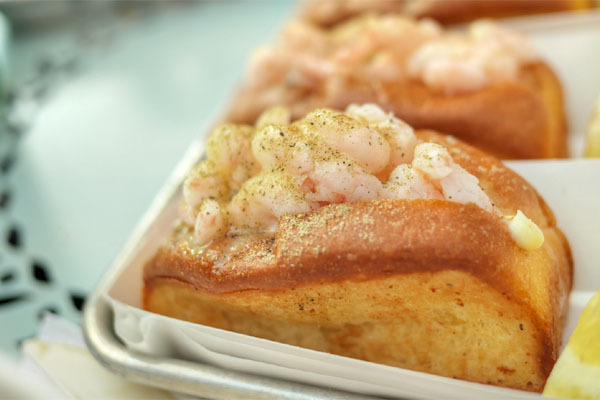 Here we see Knuckle & Claw's signature roll, made sans tail with a dab of mayo, a sprinkling of seasoning, and a dash of lemon butter, all served on a buttery toasted brioche bun. It was a tasty rendition indeed: sweet, soft and buttery, with the bread serving as a great counterpoint to the meat. I did appreciate the straightforward lobster-y goodness here, with the various accompaniments complementing but not overwhelming the seafood. 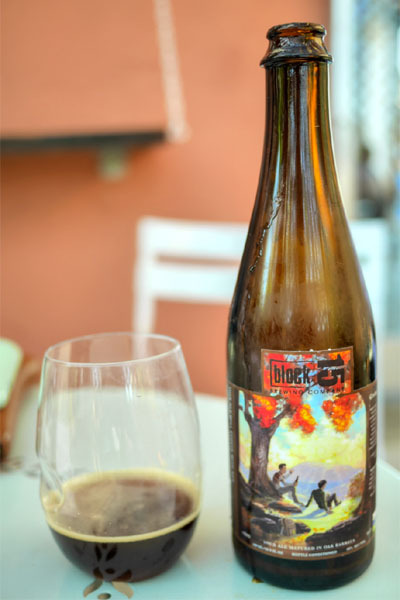 Our next bottle was the 2014 Block 15 Giving Thanks, a mix of Belgian-style dubbel and strong ales matured 11-28 months in brandy, bourbon, and rum barrels, with Lactobacillus added. This was pretty neat, a complex beer with an interplay of vinous, oaky, and dark fruit notes underscored by a pleasant booziness, bitterness, and chocolate-y malt, the whole thing finishing tart. 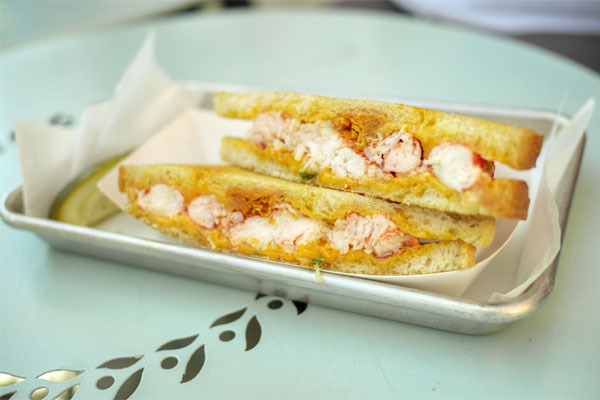 The Knuckle Sandwich was basically a grilled cheese with the addition of lobster, made using Cotswold cheese. It was a hefty, luxurious sandwich, with tons of cheese and butter on the forefront. I thought that the lobster still shined despite all the rich flavors at play, though some of my dining companions disagreed. 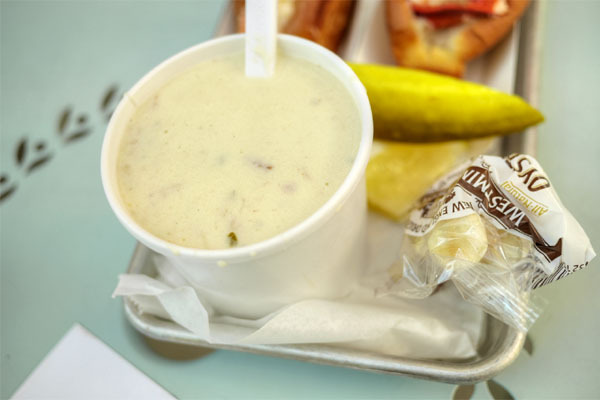 The bacon clam chowder was a joy to eat, coming out hot and savory, with a great interaction between the brine of the clams and the hearty potatoes, the soup finishing with a delightful kick of salt from the bacon. 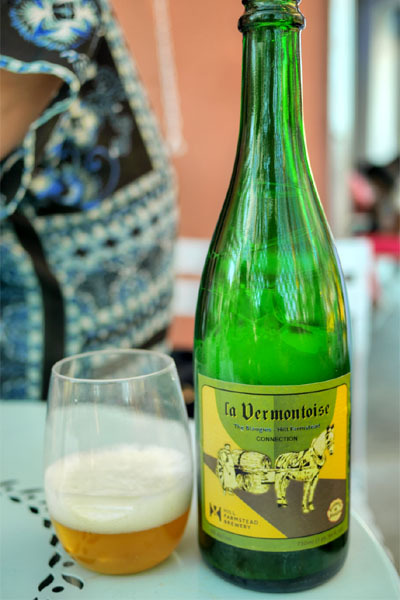 A collaborative brew, the 2014 Brasserie De Blaugies/Hill Farmstead La Vermontoise was a saison made with spelt and Amarillo hops. I found this very, very light, with some bright, yeasty nuances joined by a base of tropical fruit and spice. 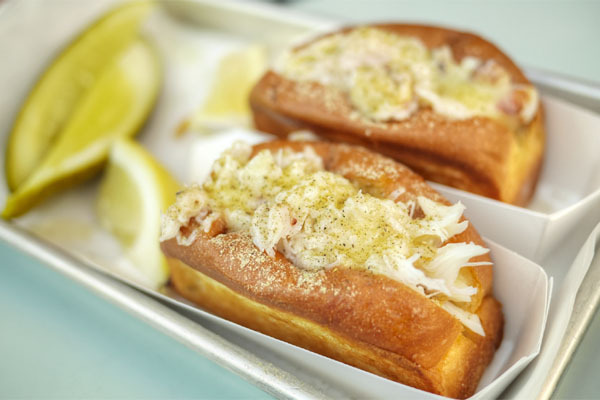 I liked the Dungeness even better than the lobster, a super sweet, saline roll that really highlighted the interaction between the crab and the buttery bun. 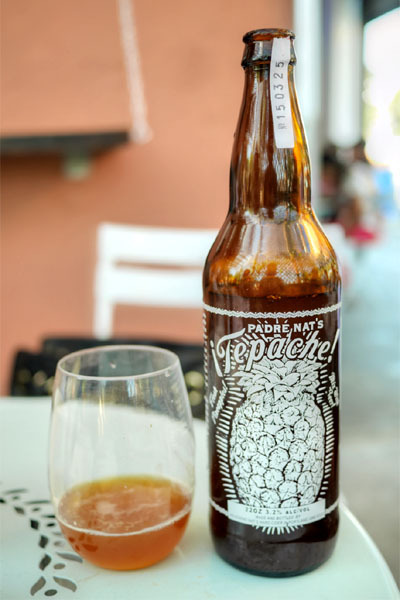 Getting into something different now, we had here the Reverend Nat's Tepache, which was a "cider" made with Costa Rican pineapple, Michoacán piloncillo, and a variety of spices. 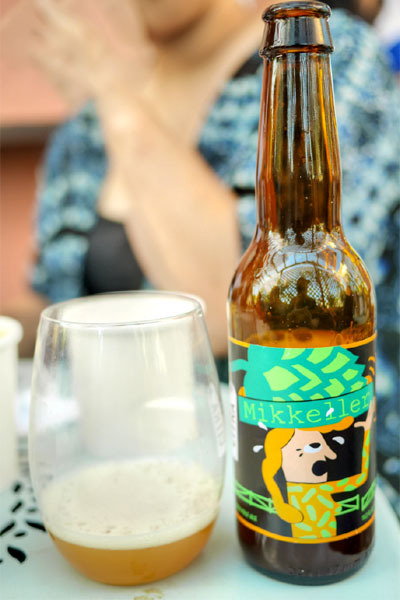 I found it deeply sweet and spicy, with loads of pineapple on the nose and lots of intensity on the palate. We were instructed by the bottle to use this in a shandy, and indeed, mixing it with the saison above really did help even out the flavors. 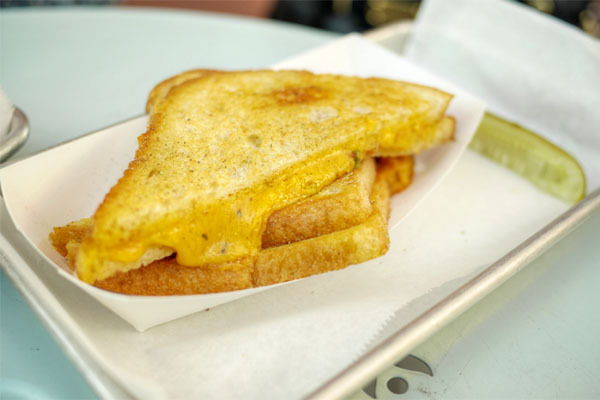 The traditional grilled cheese was classically satisfying, the cheese melding nicely with the toasty bread. 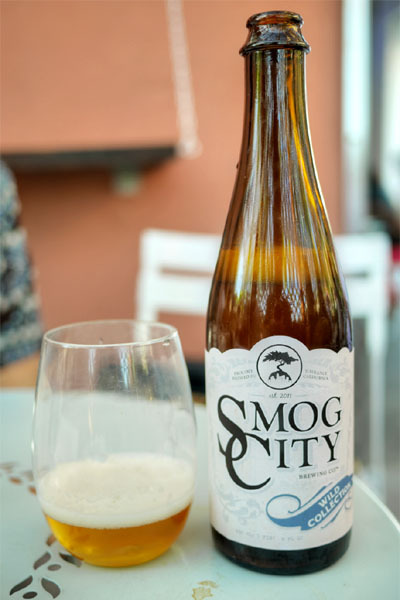 Next to imbibe was a totally different type of saison, the 2014 Smog City Saison Contraire, dry-hopped and infused with Brett. For me this was too hoppy aroma-wise, and on the palate, I got lots of dank, dusty, almost weed-like flavors intermingled with more hops. Not a huge fan. Shrimp was cool and creamy to the bite, with its mild flavors augmented by an extra helping of Booth's special seasoning. I'm usually not big into corn chowders, but this was superb: not too sweet, with the corn apparent but moderated by an undercurrent of chipotle heat. 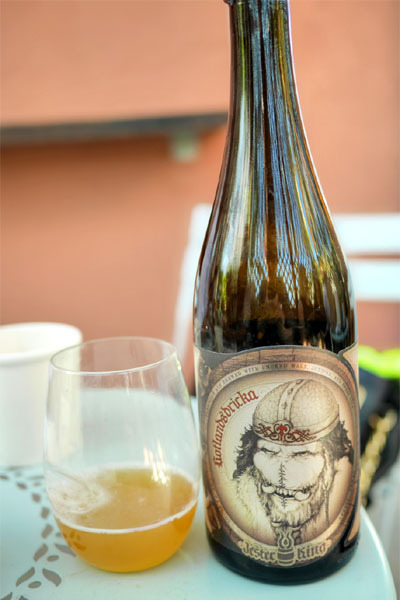 The 2015 Jester King Gotlandsdricka was a Viking-inspired brew, a recreation of an ancient farmhouse style brewed with birchwood-smoked malt, juniper, sweet gale, and rye. It was a polarizing type of beer, with loads of smoke on the nose, and a flavor profile that alternated between more smoke, tartness, and a strong blue cheese-esque funk. 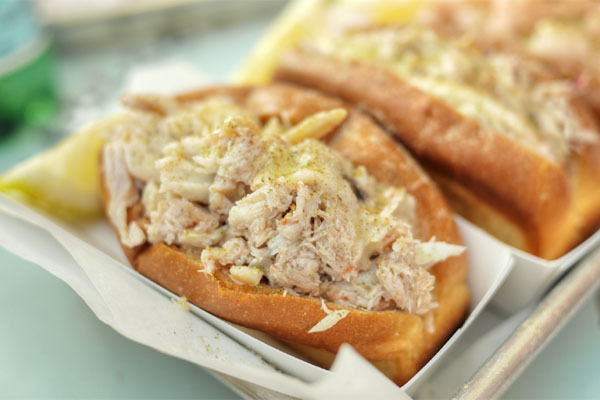 Compared to the Dungeness, the blue crab was a bit more in-your-face, with less of that subtle sweetness and more of a deep brine intermingled with palpable amounts of seasoning. 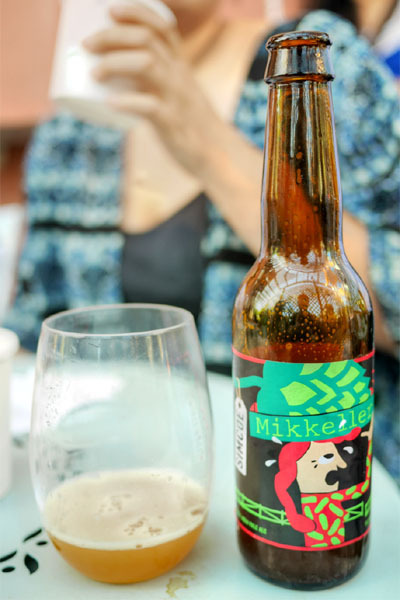 The Mikkeller Citra Imperial India Pale Ale and Mikkeller Simcoe Imperial India Pale Ale were drunk back-to-back for comparative purposes. The Citra I found pine-y on the nose, with your expected hoppy, juicy citrus notes coming through on the tongue. I definitely preferred it to the Simcoe, which had a darker, much milder aroma, and a maltier palate without all the pleasant citrus notes. 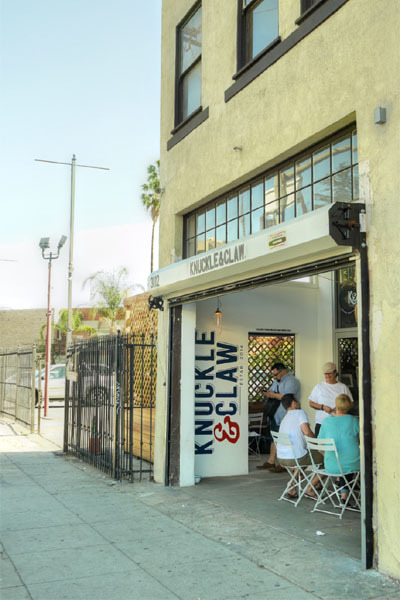 Desserts at Knuckle & Claw comprise a handful of candy bars. 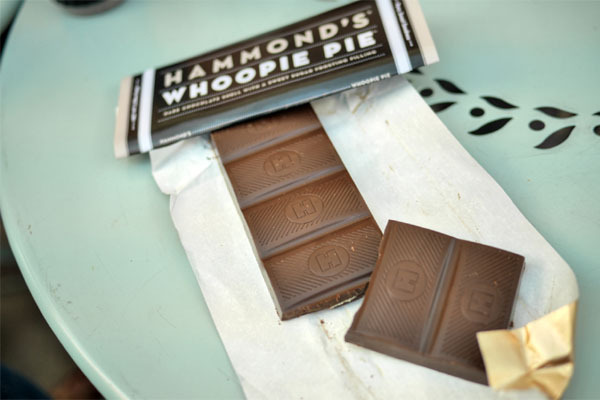 The first was Hammond's Whoopie Pie, which showcased a nice dark chocolate shell around a creamy, almost marshmallow-y filling. 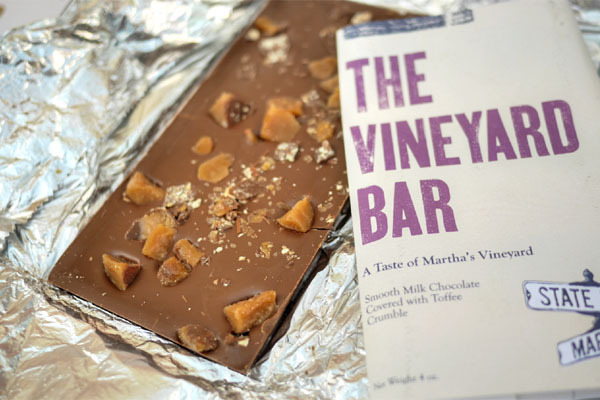 State Road's Vineyard Bar was a bit more interesting, a combination of delightfully crunchy toffee crumbles and milk chocolate. 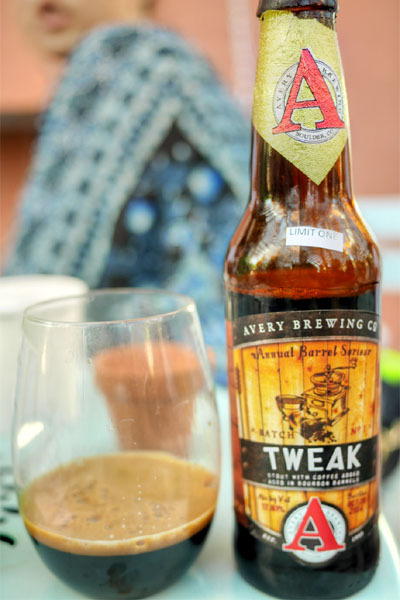 Our final beer was the 2014 Avery Tweak, a four-month bourbon barrel-aged stout with coffee added. Think boozy, with a savoriness to it, joined by light fruit, coffee, and a particular astringency that didn't sit quite well with me. Not too much barrel character. Not a fan. 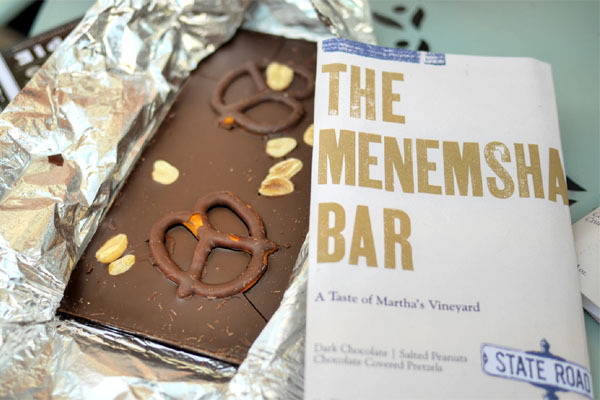 Last up was State Road's Menemsha Bar with dark chocolate, salted peanuts, and chocolate-covered pretzels. You got your classic dark chocolate flavors here, but with an additional hit of salt from the pretzel. We left Knuckle & Claw pretty content, with not much to complain about except for the sometimes inexplicably slow waits for the food. Their rolls were largely spot on, and the rest of food hit the mark as well. 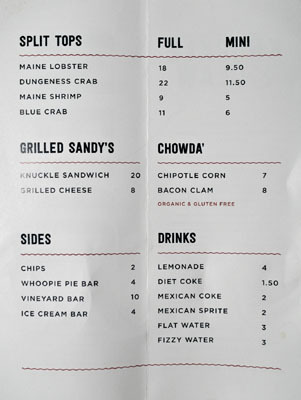 A quaint, casual seafooder that's worth checking out. 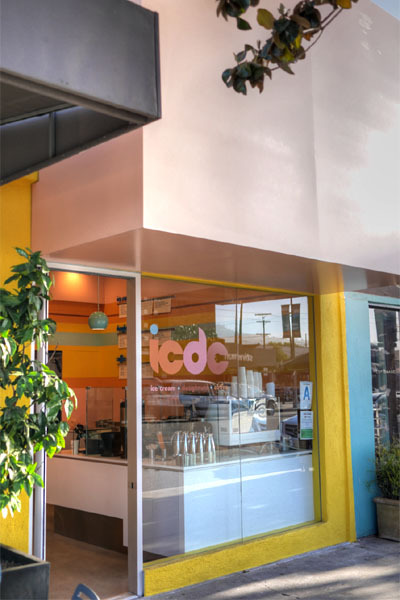 Given the lack of true dessert over at K&C, we headed on over to the newly-opened ICDC following our meal. It's a new shop next door to BLD from Neal/Amy Knoll Fraser and their longtime pastry chef Mariah Swan. 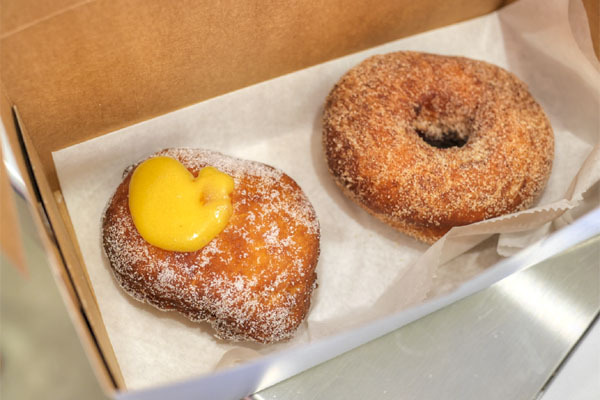 The name's an acronym for "Ice Cream, Doughnuts, and Coffee," and that's exactly what they serve. My favorite here was the Guinness Chip, which paired a classic ice cream goodness with some superb stout-y notes toward the finish. 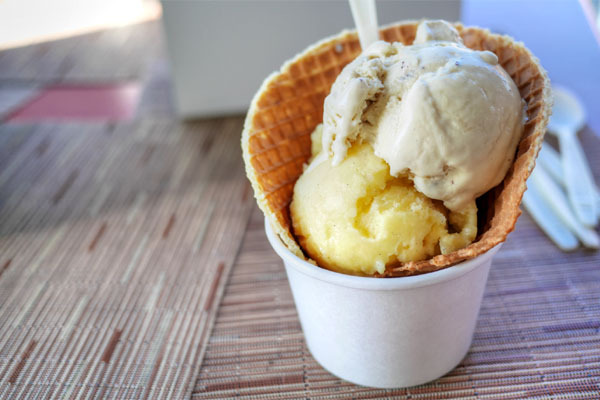 The Tangerine Vanilla Sherbet was also on point, recalling an orange Creamsicle. Donut duties were handled by a wonderfully bittersweet Grapefruit Campari and a subtle Curried Sugar. 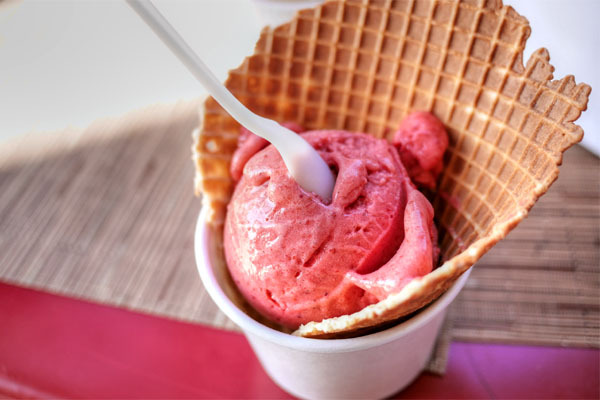 The Strawberry Rhubarb Sorbet also delivered with its intense, super jammy, super focused berry fruit flavors. 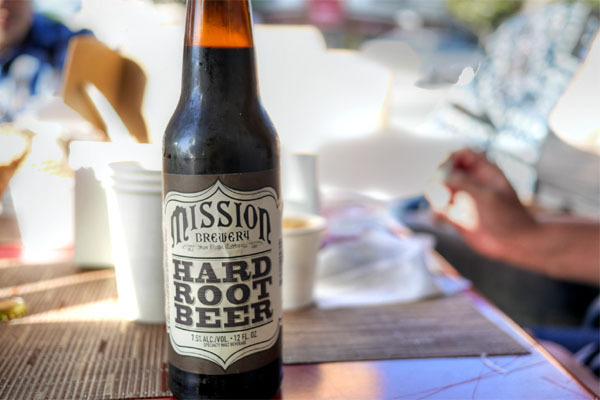 The Mission Hard Root Beer was a naturally pairing given all this ice cream. You had all your classic spicy root beer flavors here, but joined by a marked booziness on the back end. A fun one. I'm a little surprised by the long wait for the food. Maybe they are cooking to order while their guest count normalizes. Do you think that this place can accomodate a 40 minute lunch? Where do you usually go to get the beer/drinks that have been featured in your posts? A: Yeah we were surprised too, given that the food seems pretty straightforward to prep. The timing was uneven, so it you happen to get lucky, 40 minutes is absolutely doable. Anon: I'll hit up local stores like Ramirez Beverage Center. These days though, a good percentage do come from trades or directly from the breweries. And for beers that appear on this site, a lot of 'em are actually brought my dining companions.